Sugar cookies are one of the most versatile cookie recipes around. They are also one of the easiest to make. Roll them out, cut them or decorate them; sugar cookies are perfect for any occasion. 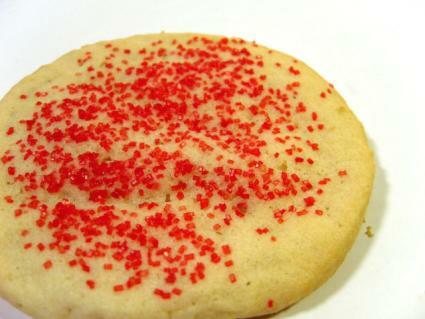 This is a great, basic sugar cookie recipe. Save the butter wrapper to grease the bottom of the glass that you are using to flatten the cookies. Mix the flour, baking soda, and salt together in a bowl until they are well combined. Using your stand mixer, cream together the butter and sugars until they are light and fluffy. Stop the mixer and scrape down the sides of the mixing bowl. Add the vanilla and egg and mix until completely incorporated. Roll the dough into tablespoon sized balls, about an inch and a half across. Place the dough balls on a cookies sheet that has a sheet of parchment paper on it. You may want to spray the paper with non-stick spray. Roll the cookies in sugar. The easiest way to do this is by pouring some sugar onto a plate and rolling the dough balls in the sugar. Place the cookie dough balls two inches apart. Flatten the dough balls with the bottom of a water glass. Rubbing the glass bottom with the butter wrappers will keep the cookies from sticking to the glass. The cookies should be about 1/4 inch thick. Top with colored sugar or sanding sugar if desired. Bake the cookies for 15 to 18 minutes. This simple recipe produces a cookie dough you can cut into any shape. 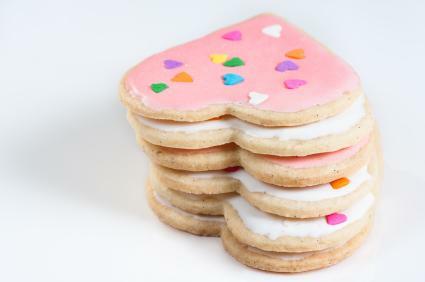 The resulting cookies are flat and durable enough to be decorated in a multitude of ways. Cream together the butter and sugar in a medium sized bowl. Beat in the eggs and vanilla extract until creamy. Slowly add the flour, mixing as you add, until it is well incorporated and you have a heavy dough. Roll the dough into a ball and wrap in plastic. Chill in the refrigerator for at least one hour. Unwrap the dough and place on a lightly floured surface. Roll out to approximately 1/4 to 1/2 inch in thickness. Use your favorite cookie cutters to cut out the cookies. Transfer the cut cookies to a cookie sheet lined with parchment paper. Bake at 400 degrees for six to eight minutes, or until lightly browned on top. In addition to these basic recipes, you can also vary them to produce several other types of cookies. Add a teaspoon of almond extract to the dough. Follow the rest of the directions for the basic cookies. Add some slivered, blanched almonds to the tops of the cookies before baking. Mix up a small bowl of equal parts sugar, confectioner's sugar, cocoa powder, cinnamon, nutmeg, and allspice. Roll the cookies from the basic recipe in the mixture before flattening and baking. 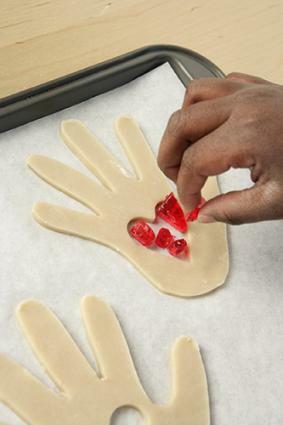 Roll out and cut the cookies in their desired shapes. Cut a small area out of the center of the cookies. Grease a piece of aluminum foil and place the cookies on the foil. Crush a piece of hard candy, such as a Jolly Rancher, and place the pieces in the cutout in the cookie. Bake as usual; the candy will melt and fill in the cutout. Make and roll out twice the amount of cookie dough. Cut out the cookies in the desired shape. Cut an additional smaller shape out of the centers of half the cookies. Spread the other half of the cookies with jam and top with the cutout cookies. Sugar cookies are so simple, you can make them for any occasion. Bake and decorate these classic cookies in any number of ways and taste the sweeter things in life.